By allowing the piano room to double as the main and family entry hall, we were able to be mindful of square footage while still creating a beautifully welcoming view for those entering the house as well as finding a place for a large piece of furniture that would otherwise have a tendency to dominate whatever room it's in. Its home here is central, yet not intrusive. We were delighted to see the finished project include hooks for hanging guitars on the wall just to the right of the piano space. It's easy to envision lively times in this part of the house! 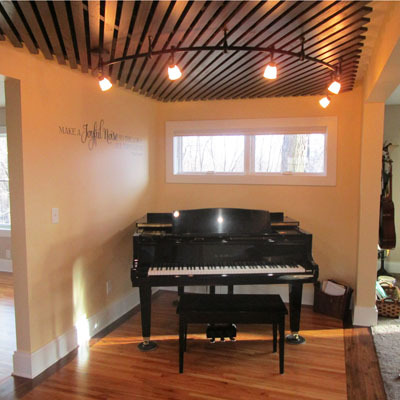 The decorative slatted wood ceiling treatment was designed to not only add a beautiful element to the entry/piano room, but also provides a place to conceal acoustic panels to help control the sound created in this space.